Contestants registered from 64 countries and submitted 250 designs in 12 building categories. An international panel of 16 jurors selected the top 50 finalists. Each building category was judged separately by at least 5 jurors, and 3 to 5 finalists came from each category. 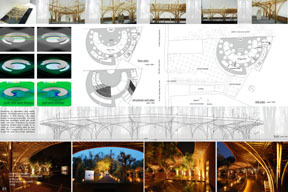 Criteria for judging were Utility (functionality), Strength (structural integrity), Beauty (aesthetic appeal), Concept and Design Development, Graphic Layout and Use and Expression of Bamboo. In the final round of judging, from the 50 Finalists, the jury panel chose the overall 1st, 2nd and 3rd prizes. Contestants voted on the Appreciation Prize. Click on exhibit thumbnails for full page image. Return to Exhibit Index. 1158 Handmade School in Bangladesh. Anna Heringer & Eike Roswag: Germany. 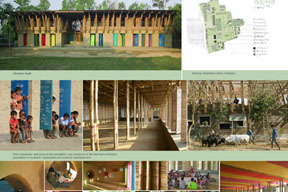 This school was hand built in Bangladesh with the community support of craftsmen, pupils and teachers guided by a European architects and students. The aim was to improve building techniques, while maintaining sustainability, strengthening regional identity. 1358 Wind and Water Cafe. Vo Trong Nghia & Nguyen Hoa Hiep: Vietnam. This Café is located in Binh Duong, Vietnam and is built to receive as much cooling as possible from the areas prevailing winds. Bamboo is used structurally and decoratively throughout, with wood from the water coconut used as roofing. Luis Alejandro Valencia Ojeda: Spain. This bus exchange station is suggested for the tropical climes of Bogota, Colombia. The beautiful curves of the bamboo ceiling provide shade and comfort for waiting passengers. Ball and socket joints are used for connecting the bamboo poles. Marek Keppl & Toma Korec: Slovak Republic. 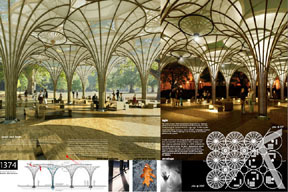 Using the parabolic curve and bamboos natural flexibility to create a lightweight structure and a pleasant, light filled environment for people to gather. Rainwater runs down the outside surface of the membrane on the conic cylinders and into retaining canals in the foundation.